Recently one of our users asked us why their WordPress website was not updating right away. Basically any changes he made to widgets or new posts would not show up on the home page right away. In this article, we will show you how to fix WordPress website not updating right away. WordPress Site Not Updating Right Away? The most common symptom of this problem is new posts not appearing on the homepage of your WordPress site. While you can still view the single post by clicking on the view post link from the WordPress admin area, you are unable to see it on the main page. Another common symptom of this issue is that changes made to WordPress widgets do not show up right away on the homepage. If you are encountering this problem, then continue reading to learn how to fix this issue. Why is my WordPress site not Updating? Before we explain the solution, it’s important to understand what causes the problem first. There are two common causes for this issue. The first one is your browser cache. Sometimes your browser (specially Google Chrome) will show you a cached copy of your website instead of showing the new one. To resolve this issue, you need to simply hit CTRL + F5 (or Cmd + R in Mac) buttons on your keyboard to reload the page. The second and most likely cause of this issue is poorly configured WordPress caching plugin. To see if a caching plugin is causing this problem, you need to see if you’re using a caching plugin on your site. Often beginners use setup W3 Total Cache and WP Super Cache. The first thing you can do is try to Empty All Caches using your cache plugin settings area. You can do this easily by going to plugin settings page (in our demo, we’re showing W3 Total Cache). Then click Empty All Caches. This should work for most folks and now the changes should be visible on the homepage. Next, you should look in your plugin settings to see if you can control what is cached by the Page Cache functionality. In W3 Total Cache menu under Page Cache, there is an option to unselect caching of front page. If you unselect that, then the front page will not be cached. Now if none of the above solutions worked for you, then you should deactivate any cache plugin installed on your WordPress site. After deactivating the caching plugin, you need to visit your website to see if this resolved the issue. If it does, then this means you need to setup your cache plugin correctly. We have simple step by step tutorials to setup W3 Total Cache and WP Super Cache plugins on your WordPress site. They are both great plugins, but we like to use W3 Total Cache with MaxCDN on WPBeginner. We hope this article helped you fix WordPress website not updating right away issue. You may also want to take a look at some of the most common WordPress errors and how to fix them. Really it is a very helpful article. Great video! however, I do not have any cache plugins of any sort. I have cleared my brower cache and still no luck Any other suggestions? im using Chrome. Have you checked with your hosting provider to ensure they don’t have caching for your site? I had a problem with my website today and found this solution and it worked perfectly. Thank-you very much. WPBeginner is always the first place that I look whenever I have a problem with my WordPress website and so far I have always been able to resolve it with the material that I find here. Very helpful. Thank-you very much. thank you very much for this. being having problem with my website not updating immediately. after this video. I uninstalled the wp super cache and my website updated immediately. thank you so much. Hello! Great article. Unfortunately it didn’t help me, and I don’t have a caching plugin. Any other solutions? I have cleared cache in Chrome as well. I am also having the same issue. Do you have any solutions? I made a few minor changes to our website content. When I test it on my computer using chrome, the updates are there. If I use IE on my computer I do not see the changes and co-workers using IE, chrome or Mozilla do not see the changes. I made the changes and then clicked update on the page in the dashboard. Please help. This could be a caching issue, please see our guide on how to clear cache in WordPress. Any suggestions for this issue? WordPress says ‘All themes are up to date’ but my theme is not up to date therefore I can’t install the latest version. My site is broken because the developer says I need the lastest version but I am stuck because WordPress says all themes up to date. Ever heard of this? My site has been down for 13 months because of this and the developer offers no support once you pay for the theme. You can use FTP to upload theme files to your server. I am having a devilish problem. I changed an image on my home page… (woocommerce storefont) — and also a product image. I have done every variation of purging possible… but the home page keeps reverting to the previous form. I have changed it other times… had a some problems but managed to get it to work. IN fact these times… I purge and reload, etc… and get the correct page. Then I immediately purge everything again… including browser of course… then it seems to work. Then I close and open and it is the wrong page again…. OR I press the top icon which takes you back to the front page and it is the old one. The mobiles show the previous home page… and the old images in other locations. ?? – totally feel like I wasting huge amounts of time over something shouldn’t even happen. I disabled super cache… got it right right… and then boom it reverted again… reenables super cache… purged everything… got it right… one click… back to the old home page… ANY IDEAS?? I do not have any WordPress caching plugin and the posts do not get updated for at least 2 hours or less. We have cloudfare cdn. We have tried everything in the books to resolve the problem This problem persists with posts and category listing where all the posts are shown of its category, This happens randomly, sometimes it will get updated and sometimes not. When logged in to WordPress we are able to see the updated content but not when we are logged out or as a visitor visiting the website. Ideally, after 2 hours everything gets updated at once. Have you tried disabling Cloudflare temporarily to see if this resolves your issue. We will also suggest contacting your WordPress hosting provider particularly if they have their own caching solutions in place. No good. I have tried everything and suddenly today NO changes of menus, widgtes, logo ect are reflected on the site, unless I’m logged in to wordpress admin panel. I’ve had so many problems with my updates not showing, and after following every piece of advice I could find online was at my wits end. However, I think I have solved it – for me, at least. My hosting is done through Bluehost and there is an automatically installed plugin called Endurance Cache (I’ve since learned this through Googling), which I think defaults to Level 2 setting. In a last ditch attempt, I set this to Level 0 and low and behold my updates appear. Im have a strange issue. 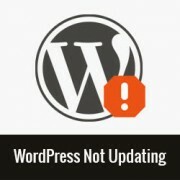 The WordPress has updated… But only on certain computers. 3 computers have the updated version of my website, where the other 2 do not. I had a small problem with text randomly fading away and never coming back on my front page, I went to fix it and now Im having the issue with different computers seeing different things. I am not sure if this is a wordpress problem, a plugin problem, or something else. Anyone else had this problem? And have you fixed it? I don’t have any cache plugin and i have this problem what is should do ? Unfortunately, I still have this issue even though I never had any caching plugin installed in the first place. The web page isn’t updating even after using ctrl-F5. I installed W3 Total Cache and followed the steps in this article. I don’t know what the issue could possibly be. this is my website, plz help me out. So I installed W3 cache plugin, and it actually seemed to slow down my site. I uninstalled it, but now my site is not reloading on google chrome no matter what I do. I don’t know how to fix it. Do I need to resinstall W3 cach plugin to fix it? Thanks! If your website loads correctly on other browsers, then try to clear your browser cache. Thank you very much for this post! I was wondering why my date on a post was not updating! It was because of the caching. And who’s going to tell my readers this? Why doesn’t anyone answer the obvious question of how to make readers get the latest version? All other websites out there seem to load the latest version so there’s clearly a solution. Thank you so much for writing this article. I have been trying all sorts of things to resolve this issue but nothing worked unless I found this article. Thanks once again for helping us out! I wanted to know How to Fix WordPress Website Not Updating Right Away I have been trying all sorts of things within in my admin area for the last 2 days with no luck. Hi, this did not work for me. I deactivate all my plugins, I cleared the cache, I changed my theme, and the 3 together… and my posts/pages still do not update. Even deleted widget stil appear in the sidebar. And it is 3 days now, of searching an answer. Do you have an idea ? You are wrong in our case. It’s been 1 week that we are changing pages which do not change on line. We remove widgets on theses pages / articles and they are still there. We completely remove plugins and widgets on all pages / articles and the pages/articles are still the same. It is really the strangest thing We’ve seen sinc we started 10 years ago. We are having a problem where our blog content is showing updates we make but any text links are not being updated. For example, changing text in a headline will show up but changing a link in the text from a location on our dev site to a location on our live site does not show up. The original link to our dev site persists and the update to the link is not reflected in the updated page. One other quirky thing is that when I am logged in as an admin the link update to our live site is shown while regular users see the old link to the dev site. What if none of the above work. IE I have no cache plugins, browser refresh doesn’t work, loading from a fresh browser on a fresh machine still shows the original page? I’ve copied the .htaccess file from a working wordpress blog I have and there is nothing in the WP section in that file. Found an odd cure based on something I read above in one of the other comments. Been fighting with WordPress for about 8 hours trying to get the new site look to appear. It had nothing to do with browser caches – I looked on machines that hadn’t loaded the site yet. Wasn’t the cache plugin in WordPress, I didn’t even have one installed on the site. Tried installing one and deleting the cache to see if that would trick it into fixing things. Tried changing between themes, turning off plugins, and so on. Finally – after reading about the .httaccess file, I went in by ftp and deleted everything off the file, reloaded the site on my browswer and the new theme and page showed up. Reinserted the text into the .httaccess file and everything seems to be working. But of course, if I change things in the future they are not going to show up. So now – any suggestion on which line in .httaccess is causing the problem? And what can be done about it. .htaccess file in WordPress is used for setting up SEO Friendly Urls. Some other plugins may also add code to this file. Generally, it has the same code which starts with #Begin WordPress and ends with #End WordPress lines. If you have just that particular code block, then this can be a bug in your theme or a plugin you are using. Try updating your permalink structure. Simply visit Settings » Permalinks and then click on the save changes button without changing anything. That would make sense, except it happened with several themes including the stock themes with wordpress installs, and no plugins active. The ONLY thing that I did that actually fixed it was the change the .htaccess file. However I didn’t try the permalink change – if I run into this issue again I’ll give that a try. Hello and thanks for the explanation. If you disable all caches in the plugins and CDN, and you can see the updates of the website, but in feedburn, ifttt, zapier, gtmetrix, pagespeed, etc continues appearing the cached content what can be happening? Somehow I am unable to see the results even after deactivating and deleting the plugin. Tried on multiple devices as well. I can see the changes when logged in as an admin, however not for non logged in users in WP. I had the same problem, was solved changing WP Super Cache from htaccess to php and deleting the rules from the .htaccess file. If you entered some time must delete it if change the configuration. See also if you have any CDN configured like cloudflare and change to development mode in the cdn panel to see if changes occur. Also can be if you have server cache like varnish or nginx proxie. Thank you so much for the quick video. I have been fighting it for hours and simply deleting my cache helped resolve the issue immediately! Is there a way to force a browser to load the latest version of my page thus overriding the browser cache? It is all well and good me emptying my browser cache so I can see the updates but that approach does nothing to fix the issue for my readers. Any tips would be appreciated?